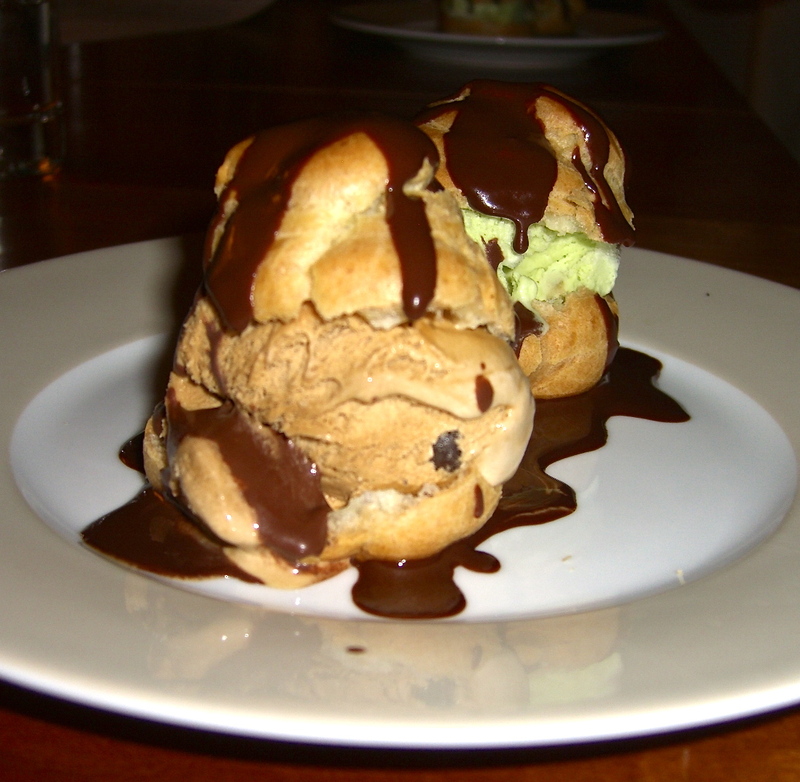 Géraldine’s Profiteroles are fairly simple to make. However, you will have much better luck if you use a baker’s scale to measure the ingredients exactly as listed. Place water, butter, sugar and salt in a saucepan. Remove from heat and add flour all at once, stirring with a spatula. Return mixture to a low heat and work for another 5 minutes until the dough forms a film at the bottom of the pan. When dough is cool, add the first egg, mix energetically. put the dough in a pastry bag or a Ziploc bag with the corner cut off, and squeeze the dough into small mounds on a baking sheet. In a saucepan, in a bain-marie (double boiler) over medium-low heat place the chocolate and stir with a whisk until it is just melted. Add the crème fleurette and water/or coffee; stir to combine. Keep sauce warm in the bain-marie. Cut the choux in half. Place a scoop of ice cream on the bottom piece and cover with the top piece.